As background to this month’s cover story, let me share a thought told by Rav Shlomo Brevda, zt”l. One of the key moments in the Purim story is when Mordechai refuses to bow to Haman (Esther 3:2). Haman was the second most powerful man in the Persian Empire, which ruled the entire civilized world, including all its Jews. Everyone bowed to him — except Mordechai. When Haman found out, he vowed to kill Mordechai. That set in motion the events that led to the royal decree to exterminate all Jews – as well as the miracles that thwarted the decree, ending with the execution of Haman, his sons and thousands of other anti-Semites throughout the empire. Rav Brevda, quoting the Vilna Gaon in his commentary on Aggados Megillah, says that Mordechai’s act served as a tikkun for an old communal transgression that had never been properly expiated. When the Jews were first sent into exile by Nevuchadnetzar he erected a huge statue and called all the leading dignitaries of all the peoples in his domain to meet in the valley where the statue resided. At the designated moment, everyone was supposed to bow. Those who refused would be thrown into a furnace. Everyone bowed, including all the Jews, except for three brave youths, Chananiah, Mishael and Azariah, who were miraculously saved. The Gemara (Megillah 7) tells us that those Jews who bowed to the idol of Nevuchadneztar did not intend it to be an act of avodah zarah. Rather, they acted out of fear of Nevuchadneztar. However, it had the appearance of avodah zarah, and thus was a chillul Hashem. It was several generations after Nevuchadnetzar when Mordechai refused to bow to Haman. “Why are you defying the royal decree?” the royal servants asked him. Mordechai informed them that he was a Yehudi (a Jew), and avodah zarah was forbidden; he would never bow down to Haman, who had made himself into an object of worship (Megillah 10b, 19a; Sanhedrin 6Ib). Mordechai’s kiddush Hashem served as rectification, tikkun ha’chet, for the chillul Hashem of bowing to Nevuchadnetzar’s idol. In so doing, he undid the earlier wrong and thus set up the deliverance of the Jewish people. Rav Brevda goes onto explain that the real sin here was that the Jews had come to rely on a power other than Hashem. They looked for help from foreign powers, from persons of great influence or on their own ingenuity and efforts. The tikkun was to absolutely disregard all powers on Earth; to turn only to Hashem for a salvation through prayer and teshuvah. That is one of the great lessons of Purim: our reliance on Hashem and the primacy of tefillah and teshuvah. The situation in our cover story was not exactly the same, but there are striking similarities. As such, perhaps it is meant to drive home the point that this lesson is still very current, and one of the primary challenges of our times. 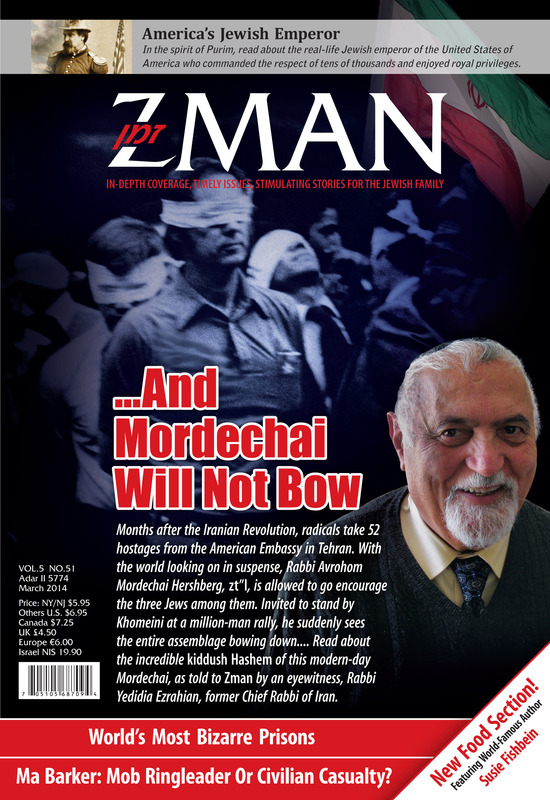 This entry was posted in Holidays, Purim, Uncategorized, Zman Magazine and tagged Iran hostages, Mordechai, Purim.